The Cited Scientists project sums up the publication activity of Tomsk Polytechnic University scientists during summer 2018. The share of TPU articles in the Q1 journals keeps increasing, there are also publications co-authored by TPU researchers and leading foreign scientists. H-index of the most cited co-author among TPU scientists is 36. The IF of the most rated journal where TPU scientists published their articles is 4.857. Science Communication School to be held on 3-5 October at Tomsk Polytechnic University is aimed to develop publication activity of early-career scientists. The School will cover such topics as efficient communication at conferences; study results publication in high-rated journals; key trends in science communication and so on. Researchers and students of TPU are invited to participate in the event. Tatyana Vakalova, Kizhner Research Center (KRC) professor, Valeriy Pogrebenkov, Kizhner Research Center professor, Vladimir Vereshchagin, Kizhner Research Center consultant-professor, Tamara Khabas, Kizhner Research Center professor. A fractional (rational) chemical analytical method is proposed by which the material composition of clay rocks can be quantified and the clay-forming minerals present can be characterized. Subjecting raw clay to this procedure allows for the determination of the chemical composition of its fine-grained fraction, the amount and composition of exchangeable cations, water-soluble salts, carbonates, and colloidal minerals, and the amount of amorphous silica and free quartz. A new, effective method is proposed for the qualitative and quantitative evaluation of the amorphous component in clays. This involves extracting colloids by treating the clay fractions with Tamm's reagent, a buffer solution of oxalic acid and ammonium oxalate with a pH of 3.25. Additionally, through calculations based on the results of chemical analyses, the illite content (derived from the content of non-exchangeable potassium oxide) and the chemical composition of the clay residue are determined. This enables the rock-forming clay mineral to be characterized and its structural chemical formula to be determined. This allows prediction of the physicochemical and technological properties of the clay. Irreversible myocardial damage happens in the presence of prolonged and severe ischemia. Several phenomena protect the heart against myocardial infarction and other adverse outcomes of ischemia and reperfusion (IR), namely: hibernation related to stunned myocardium, ischemic preconditioning (IPC), ischemic post-conditioning, and their pharmacological surrogates. Ischemic preconditioning consists in the induction of a brief IR to reduce damage of the tissue caused by prolonged and severe ischemia. Nitric oxide (NO) signaling plays an essential role in IPC. 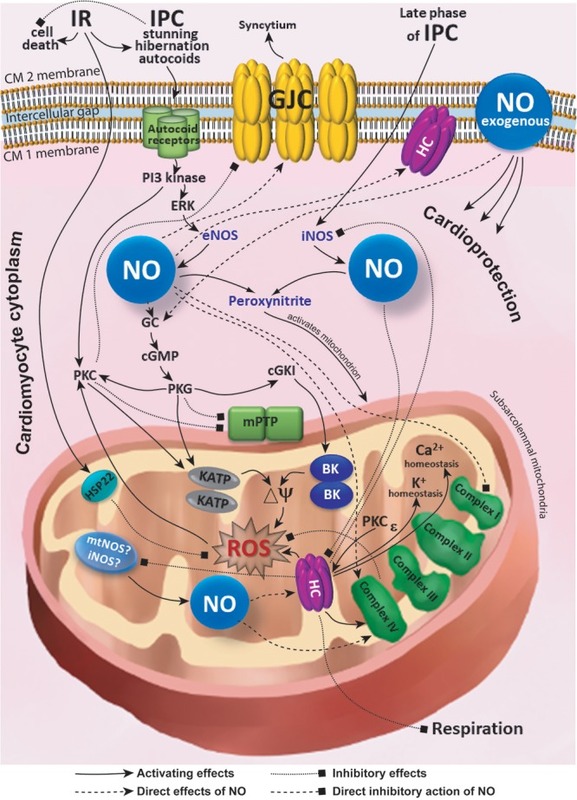 Nitric oxide-sensitive guanylate cyclase/cyclic guanosine-3′,5′-monophosphate (cGMP)-dependent protein kinase type I-signaling pathway protects against the IR injury during myocardial infarction. Mitochondrial ATP-sensitive and Ca2+-activated K+ channels are involved in NO-mediated signaling in IPC. Independently of the cGMP-mediated induction of NO production, S-nitrosation represents a regulatory molecular mechanism similar to phosphorylation and is essential for IPC. Unlike conditioning phenomena, the mechanistic basis of myocardial stunning and hibernation remains poorly understood. In this review article, we hypothesize that the disruption of electrical syncytium of the myocardium may underly myocardial stunning and hibernation. Considering that the connexins are the building blocks of gap junctions which represent primary structural basis of electrical syncytium, we discuss data on the involvement of connexins into myocardial conditioning, stunning, and hibernation. We also show how NO-mediated signaling is involved in myocardial stunning and hibernation. Connexins represent an essential element of adaptation phenomena of the heart at the level of both the cardio- myocytes and the mitochondria. Nitric oxide targets mitochondrial connexins which may affect electrical syncytium continuum in the heart. Mitochondrial connexins may play an essential role in NO-dependent mechanisms of myocardial adaptation to ischemia. Vladimir An, As.Prof. at Kizhner Research Center (KRC), Li Jing, Wu Aimin (h-index 15), Dalian University of Technology, Liu Baodan (h-index 25), Yang Bing (h-index 8), Yang Wenjin (h-index 9), Zhang Xinglai (h-index 8), Jiang Xin (h-index 36) — Institute of Metal Research, Liu Fei (h-index 17), Sun Yat-sen University. Photoelectrochemical water splitting has emerged as an effective artificial photosynthesis technology to generate the clean energy of H2 from sunlight. The core issue in this reaction system is to develop a highly efficient photoanode with a large fraction of solar light absorption and greater active surface area. In this work, we take advantage of energy band engineering to synthesize (GaN)1–x(ZnO)x solid solution nanowires with ZnO contents ranging from 10.3% to 47.6% and corresponding band gap tailoring from 3.08 to 2.77 eV on the basis of the Au-assisted VLS mechanism. The morphology of nanowires directly grown on the conductive substrate facilitates the charge transfer and simultaneously improves the surface reaction sites. 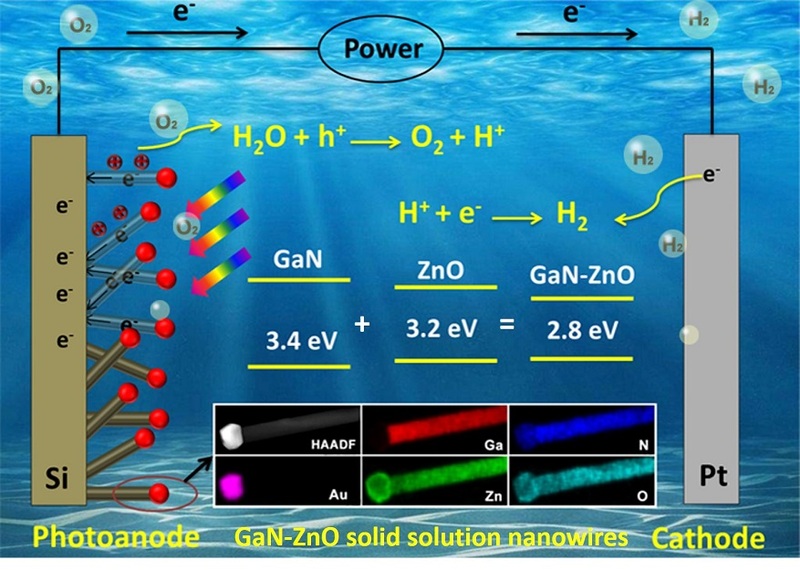 As a result, a photocurrent approximately 10 times larger than that for a conventional powder-based photoanode is obtained, which indicates the potential of (GaN)1–x(ZnO)x nanowires in the preparation of superior photoanodes for enhanced water splitting. It is anticipated that the water-splitting capability of (GaN)1–x(ZnO)x nanowire can be further increased through alignment control for enhanced visible light absorption and reduction of charge transfer resistance. Olga Vysokomornaya, As.Prof. at the Research School of High Energy Physics (RSHEP), Ivan Voytkov, a PhD. 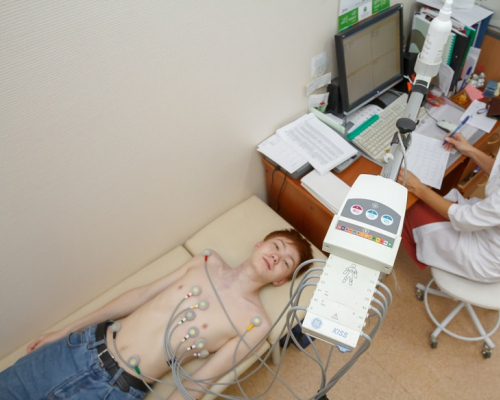 Student at RSHEP, Geniy Kuznetsov, a principal researcher at the Butakov Research Center, Anna Abramova, a master student at the Butakov Research Center. High-temperature (over 500?K) evaporation of water, emulsions, slurries, and solutions has been extensively studied over the recent years due to a number of prospective applications. Some of these are, for example, the evaporation or burnout of impurities in the course of for thermal wastewater treatment, gasification, as well as flue gas waste heat recovery by intermixing them with water and water vapor to create a new generation of heat transfer agents. Further development of these technologies is constrained by the fact that the approaches used so far are mostly empirical. 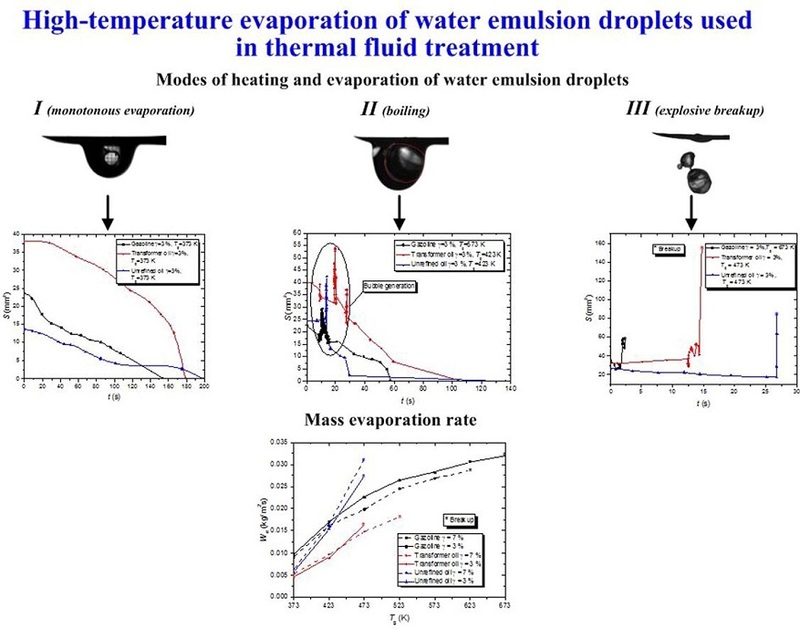 Obtaining reliable experimental data on evaporation characteristics (vaporization rate and lifetime) of water emulsion droplets in the course of thermal evaporation and burnout of impurities is a pressing task. It is also desirable to experimentally cover all the temperature ranges, droplet sizes, and component concentrations, typical of advanced water treatment. In this research, we use a high-speed hardware-and-software system to track the free surface of a droplet. We determine the dependence of heating and complete evaporation time as well as heating and vaporization rate on the gas environment temperature, droplet size, and emulsion component concentration. We then derive the approximating equations for the dependencies determined. The difference in evaporation conditions and characteristics is also defined for droplets of water and emulsions with different additive types and concentrations. Finally, we outline different modes of evaporation as well as the required conditions for monotonous evaporation or explosive breakup (pulverization). Dmitri Chernyavsky, an assistant at RSHEP, Hajian Kamal, Institute for Research in Fundamental Sciences (Iran). Cosmological constant can always be considered as the on-shell value of a top form in gravitational theories. The top form is the field strength of a gauge field, and the theory enjoys a gauge symmetry. We show that cosmological constant is the charge of the global part of the gauge symmetry, and is conserved irrespective of the dynamics of the metric and other fields. In addition, we introduce its conjugate chemical potential and prove the generalized first law of thermodynamics which includes a variation of cosmological constant as a conserved charge. We discuss how our new term in the first law is related to the volume–pressure term. In parallel with the seminal Wald entropy, this analysis suggests that pressure can also be considered as a conserved charge. Roman Volkov, As.Prof. at RSHEP, Pavel Strizhak, RSHEP professor. Today, requirements to the resource efficiency of power plants are becoming increasingly stringent, but hardware limitations are still there. The scientific community keeps searching for the ways to intensify heat and mass transfer and phase transitions in many applications of heat and power industry, such as heaters, economizers, cooling towers, heat carriers based on flue gases, water vapors and droplets, superheaters, etc. The answer might be in the potential (or latent) reserves in the energy performance indicators of heat and mass transfer processes. Dependences are obtained of maximum convection velocities in droplets on the temperature and velocity of the incoming heated air flow as well as on the droplet size. The resulting experimental database will help develop advanced models of high-temperature droplet heating and evaporation. The results of the experimental research are processed to determine the dominating processes of heat and mass transfer in the droplets and in their near-surface steam-gas layer. 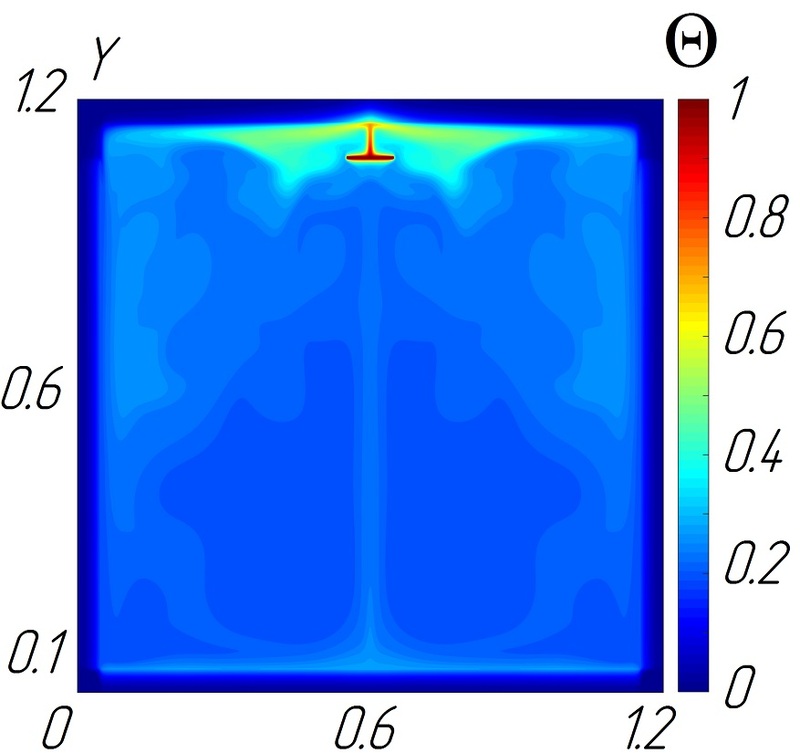 This study deals with the numerical investigation of combined heat transfer by conduction, turbulent natural convection, and surface thermal radiation in a closed square air-filled cavity with a local radiant heater. The turbulent flow was computed within the quasi (pseudo) direct numerical simulation approach. The governing equations were solved by means of the finite difference method. The developed numerical code was validated by comparison of temperature profiles obtained experimentally and numerically. The effect of time, buoyancy force, walls emissivity, and emitter height on local and mean heat transfer characteristics were studied. For the first time, it was found that the mean convective Nusselt number at the bottom solid-fluid interface was slightly altered in the cavity with the local radiant heater when varying the governing parameters. An increase in the Rayleigh number led to a significant rise in the overall temperature. The isotherms and streamlines were significantly altered with time. However, the mean radiative Nusselt number was slightly changed over the time. Elena Fell, As.Prof. at School of Core Engineering Education (SCEE), Natalia Lukjanova, SCEE professor. This study is relevant, since it makes it possible to examine the role of a person with a disability in society from a different point of view, rather than from the perspective of the traditional social model of disability. A review of relationships between a disabled person and the society in which he/she lives is necessary to address issues related to inclusion. This study is of interest to philosophers dealing with ontology. In addition, other experts studying the nature of time may be interested in Cameron's theory.